I am so loving the changes that were made in my dining room. The whole room is so much lighter and brighter than when it was painted red. Still have a few things to do in here, but there are other projects that must be tended to, the biggest one being, organizing the tax information for my extended family's rental business, our info, and doing the actual tax returns for both my daughters. This is the way I keep my dining room table when it's not set. I keep out the silver chargers with some pretty napkins on them. Maybe I'm just too lazy to put them away! I changed the shades on the chandelier. The chandelier sheds more light in the room than the previous black shades which sent the light down. I still want to add some crystal beads for some bling. Pam what a beautiful spring table!! Love your dining room, and I know you love the lighter color. I love those napkins!! Pretty changes Pam. Your spring vignette is beautiful. Love the lightness of your dining room. Your dining room looks great! Love the table runner. Just gorgeous Pam..I love the natural sticks too! Yes, your dining room is something! 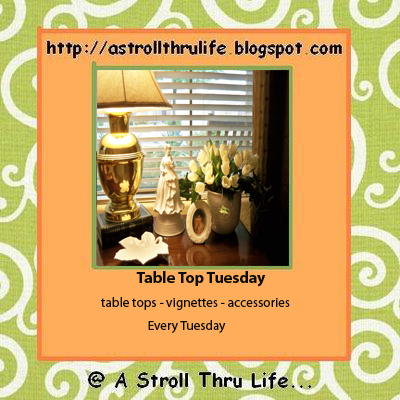 Love your tablescape...so pretty! It's always fun to change up the color of a room... suddenly there is inspiration everywhere. I love what you have done. All of the details are perfect. You really have the magic touch! You did NOT find that beautiful piece of work at Goodwill! Our Goodwill is NOT what everyone else's seems to be :/ and I like you love to have my place settings :) tables with beautiful vignettes alone grab my attention but I always end up with something in front of each chair :) Have a blessed week!!! Love your attention to detail. The runner is a fabulous find and I love the use of branches as the centerpiece. Ain't nothing like a little bling! Your table looks fresh and ready for spring. I have a larger version of your centerpiece. I love your branches sitting in it, so simple but just perfect for waiting for spring. Thanks for sharing. Hi Pam, I love your spring dining room….the runner is so classic and I love the candle piilars. The birdie is adorable and timely, I saw my first red bird (robin) yesterday on our front lawn!Thank you, Emelia. Love the glass vessel used as a centerpiece, great piece. What a lovely vignette! I adore the candle holders. I missed this yesterday! I really do like this color you chose for your dining room. It's wonderful! I've had black shades before and yes they do direct the light down when it's on. I love, love, love your pineapple lamp! I haven't noticed it before. I like this set up for an unset table! I may have to borrow this idea with the napkins and the chargers. It's a nice look! So pretty, Pam. I know you are enjoying your new room. Thanks for joining WUW. It looks very pretty! I love the branches!